I’m a little short on time today, since it’s a typical Monday. Today’s 30 Day Ramadan Crafty Challenge has to be a quick and easy one. Today I thought it might be fun to decorate the table where we eat dinner. We made a festive table runner out of crepe paper. The little Eyptian man and woman above are wood figures I picked up in the Egyptian souk. I wish I had written down the artist’s name! measure, we just wanted to make sure the ends were long enough to be covered by the place mats. white. The crescent moon and stars are made from a craft punch I have. 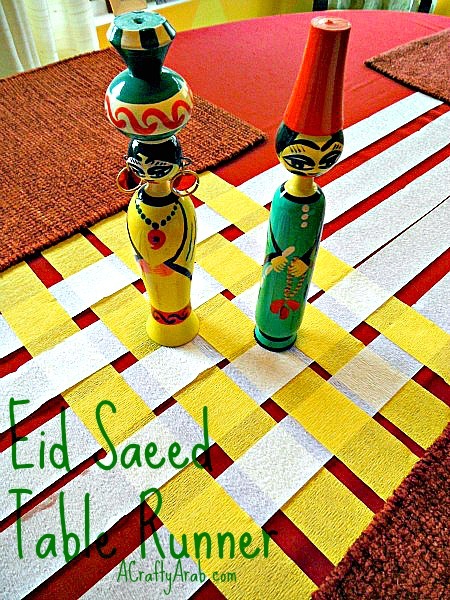 “Eid Saeed” means Happy Eid.